Zephyrhills 100th Anniversary: Willie’s Taxi and the Fish Pond - Zephyrhills, Florida 100th Anniversary! As you recall special times in your own childhood, you undoubtedly remember key places and events. We have been fascinated by the fact that two “institutions” are frequently mentioned as folks share stories of Zephyrhills and Zephyrhills High School history with us— namely the signature fishponds and Willie’s Taxi Service. You may ask why we have combined these two characteristic establishments. Read on. Willette Phillips had a taxi service in the late 1940s and ’50s. Her stand was at the drinking fountain on the corner of 5th Avenue and 7th Street that advertised “Zephyrhills, City of Pure Water.” It was good drinking water without all the chemicals that are used today according to the book Zephyrhills From A to Z.
Jon Ferguson of the ZHS class of 1951 provided us with some insight: Willette Phillips established the first taxi cab service in Zephyrhills. Competition soon joined her because of her business prowess. For example, Maurice Humphreys set up a similar business across the street from her. Willie’s booth was on the corner of 5th Avenue and 7th Street. A popular gold fish pond was nearby as well as the only public drinking fountain. Willie had a black and white television set in her nook. This was definitely the place to stop by and get the latest local news! Willie was always hospitable and everyone loved her. Drivers for Willie's Taxi Service were expected to appear professional while performing their duties. Scenic points-of-interest around Zephyrhills for most of the 20th century included some charming sites: several fish ponds inhabited by goldfish (koi–members of the carp family), a wishing well, a limestone bridge at Zephyr Park and the occasional building (such as the Women’s Club on 5th Avenue) were crafted from a natural resource, local limestone rock. We learned from our review of school history that before 1970 Zephyrhills High School also had a koi pond similar to the one by Willie’s, that was tended by the school principal and proudly protected by ZHS students. The school pond was constructed by George McGinnis and his son, James Douglas McGinnis and built around 1946. George’s daughter, Donna McGinnis Neal and son, Herbert McGinnis, described their recollection of the signature ZHS pond: It was approximately eight feet horizontally, and made of stone with a dome that covered approximately one-third of the pond to provide shade. They marvel to this day at how their dad was able to build the free-standing dome. McGinnis built many other ponds for Zephyr Park, one of which had a bridge walk-way. My family lived what seemed a long way out of town on West 54, although recently revisiting our old home place, realize it is only 4 or 5 miles. We had to ride the bus and I always envied the kids that just walked to school and could hang out around and cut up after school, instead of hurrying to catch the bus. One of these friends invited me to spend the night with her because there was a party at another friend’s house that night. I thought it was well arranged and I was excited. The party didn’t turn out as I had expected. Then we walked o her home and met with her mom, screaming that we were late, and what was she doing bringing someone home with her. i was in a panic as we went to her room and to bed. As soon as the house got quiet I slipped out and walked downtown to Willie’s corner. The streets were deserted and i wondered how long it would take me to walk home if she wasn’t there. She was, and she just told me to get in and let’s go. She assured me I shouldn’t be upset or afraid and that my mom and dad would be really glad I came home. I’m not sure Willie ever got paid for that ride but she was truly an angel for that young damsel in distress. My family moved to Zephyrhills in 1946 – we did not have a car so we walked EVERYWHERE and it didn’t seem hard when you are only 6 years old (it sure would now). I remember a fish pond located downtown next to “Willie’s Taxi” (her office was a tiny stand). The fish pond was made with big rocks and it was full of huge goldfish. We would feed them bread or crackers and the pond was surrounded with huge elephant ear plants to keep the hot sun off the fish. There was also a water fountain (made with the same type of rocks) and that water was always so good and cold, especially after walking the mile from our house to town. Willie was a tall woman in stature and also had a good business mind with her successful taxi business on 5th Avenue for many years. She sponsored many softball teams and was an avid sports fan! Willie’s Taxi was on the corner by the water fountain which proudly proclaimed, Zephyrhills—the City of Pure Water! 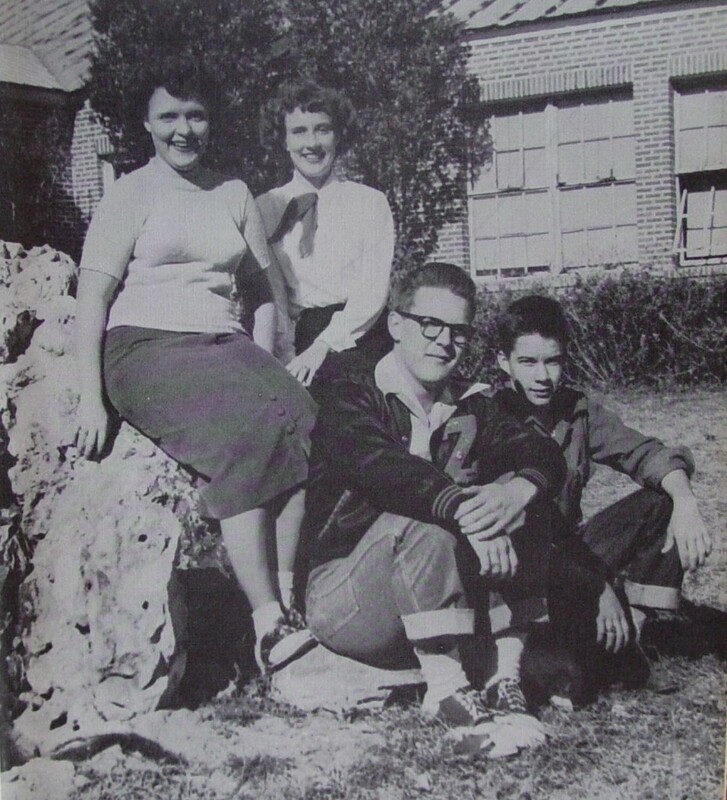 A photo from the 1951 Zephilsco shows the ZHS school pond with students, Joyce Baker, Mary Ann Vestal, Jack Lamb and Rex Gilbreath. I remember that unique gold fish pond in front of Willie’s! In the mid 1960’s, I would go to Willie’s Taxi and toss a penny in the wishing well. The only public restrooms were located nearby and segregated. When I relocated to Zephyrhills in the mid 1950’s there were two water fountains at Willies, one marked “Whites only”, and the other “Colored only.” My how things have changed for the good! Willie’s was a nice place to find a cab ride home! I remember vividly the day we were walking past Willie’s and we stopped to get a drink of water. I was in 4th grade at the time and I was puzzled at a sign above the fountain that said, “Whites Only.” I had no idea what it meant and when I asked my dad (a ZHS teacher) to explain what the sign meant, I was really shocked. I remember he added that we did not believe that segregation was right. How wonderful times have changed! As a little kid, I could walk around town in complete safety. I’d walk from the municipal pool into town and if I had a few coins, I’d head to Neukom’s, Elsie’s 5 and 10, or Lamb’s Toy Store and I would pass by Willie’s. You could watch the goldfish in the rock pond or stop for a cold sip from the only water fountain in town. Willie was a kind and generous lady. She lived in a house that faced the football field in front of the school. There were lots of orange trees, and those of us who for one reason or another stayed after school and watched football practice were welcome to pick some green oranges to refresh ourselves in the afternoon heat. To this day, football season brings memories of tart green oranges and sweaty boys. Adjoining Wille’s Taxi service was a fish pond and we would feed the fish and throw in coins. I wish that pond was still there…I loved it as a kid. By Madonna Jervis Wise and Clereen Morrill Brunty of the 100th Anniversary Committee, ZHS. Article originally appeared in the Zephyrhills News on August 13, 2009.